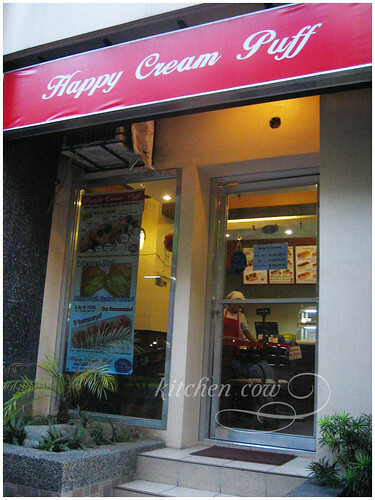 Happy Cream Puff is a small pastry shop that specializes in Cream Puffs. Entering the cozy little store, you’re greeted by a display case of all sorts of cream puffs. Caramel-glazed, chocolate-covered, plain, plus a couple of eclairs—they’re made from the same choux pastry dough after all. While there’s a wide variety on display, these are actually empty puff pastry cases. 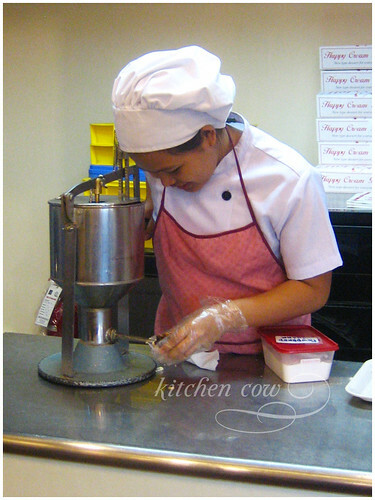 The chilled custard cream is piped in only as you order. This sometimes causes the queue to build up, but trust me, it’s worth it to wait. 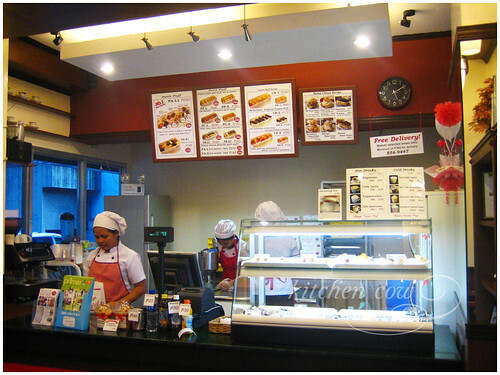 The simplest pastry you can get at Happy Cream Puff is the plain cream puff. It’s a light, puffy pastry that’s filled with chilled custard cream. Their custard cream uses actual vanilla pods, hence the occasional black flecks you can find in the cream. I like how the custard cream possesses just the right amount of sweetness. It stops a few notches short of being sweet so you keep wanting more in an attempt to hit that sweet spot. That’s always a good thing in my book. 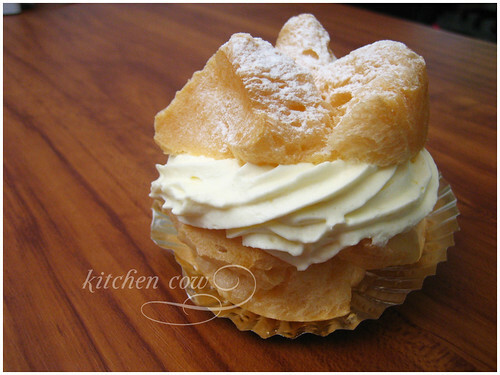 Less taste fatigue, more cream puff goodness, letting you enjoy your cream puff from start to finish. Closer to the Cream Puffs we’re accustomed to (I grew up with the ones from Manila Pen and Dulcinea) are the caramel-glazed cream puffs. 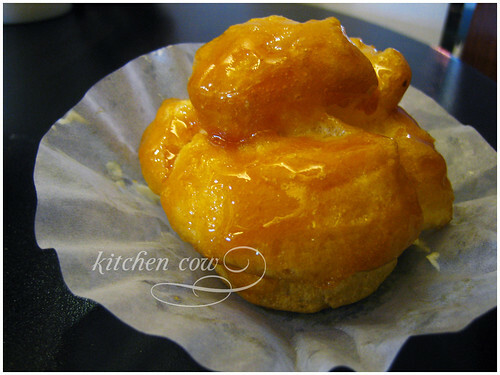 It’s the same cream puff as the plain one, only it’s glazed with a sweet caramel coating that crunches lightly with each bite. Perfect for those who want something sweeter. One of my favorites is the W-Choux (pronounced double chu), a double cream confection. It’s your basic cream puff, stuffed with two layers of cream: the classic custard cream, topped with freshly whipped nama cream. The nama cream has a hint of lemon that adds an extra dimension to the rich cream. Topped with a dusting of confectioner’s sugar, it’s absolutely perfect. It looks like you’ve sampled nearly everything there! It’s certainly a nice bookend to a good bento lunch — though I really don’t need an excuse to eat some cream puffs! WOW! I had no idea that cream puffs could be so glorious! hehehe… Err where is this? Is there a branch in the Block? I think I saw one? Will consider giving them as gifts and will vicariously taste them. OMG. i love cream puffs! eclairs and stuff. i can’t get enough of them. and the idea that you can eat them sans the caramel coating is just…gosh, making me hungry (when i’m supposed to go to bed). Free makes it even better! More than gorgeous and glorious, they’re absolutely nyummy! I try not to think of diets, but I fear this’ll set you back by a lot of calories I don’t know if there’s a branch at The Block though. I hear there’s one at SM Southmall and at Metropolis in Alabang but I haven’t checked them out personally. Go. Eat. NOW! So worth it. Not just any cream puffs, but Cream Puffs that’ll make you happy! Aaaaaaaaaaaaah! This post makes me happy already. I love cream puffs!!! hi approximately how much per cream puff? Oh yes this place! It’s behind my building. I went there on the day/afternoon they opened. It used to be this cafe with wifi thing. I personally love their eclairs and w-choux. I also love love Cream Puffs and Happy Cream Puff is one of my favorite, I love their caramel glazed puff and their petite eclairs.. There used to be a branch at Metropolis in Alabang, but I’m not sure if it’s still up. Best to call them at the number listed above to find out if it’s still open. I’m sure they’ll be able to let you know about other branches too. Good luck Kc! I was really happy to see this review because i love this place. Not a whole load of people know about it… and I always love introducing my friends to the taste. 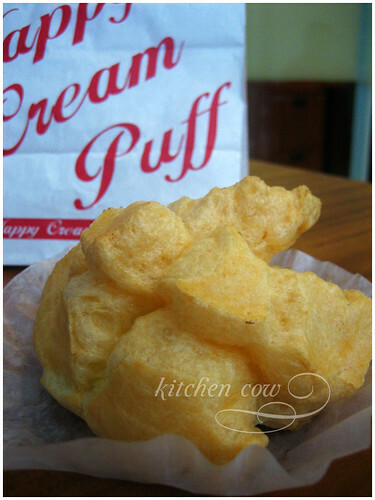 For me, its impossible to pass by the Happy Cream Puff and not grab a box for take-home.